Until August 19. 2018 Bernard Heesen is without a doubt the most baroque and self-willed and glass artist of the Netherlands. In Rijksmuseum Twenthe he exhibits recent work that was inspired by a period, that was often called 'the ugly time' ; the 19th century with all its neo-styles. 'Try blowing them like this! 'said Bernard Heesen in 1997 to eight of the best glassblowers of Bohemen, wo were waiting for instructions. With 'this' Heesen meant the astonishing engravings of jugs, vases ans arabesques from a 19th century encyclopedia, which he had recently bought. 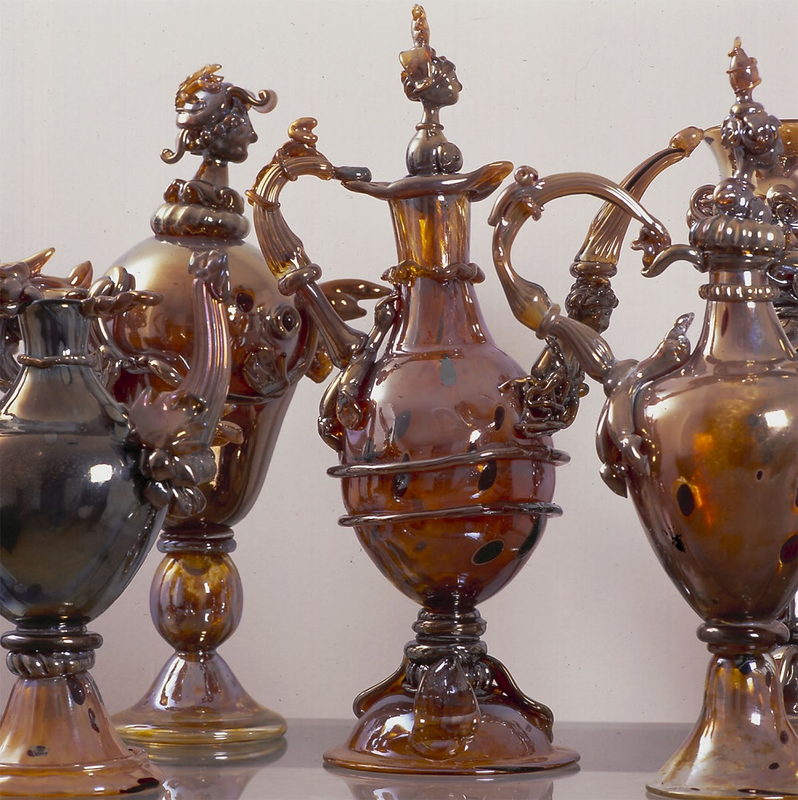 The reference work provided a solution, just when his fascination for glass and glassblowing gradually faded.His handling of the liquid glass had become easier over the years and the limits to what was technically impossible seemed already reached. But with this reference work, he discouvered a new source of inspiration. 'I executes one after another structure down to the very last detail, with an enormous pleasure', says Heesen. Search to the boundaries of ornamentation and ugliness From that moment on the 19th century illustrations formed the starting point for many of his glassworks. It's not so much about imitation in itself, but the imitation is a strategy to get to forms and objects he could never have imagined himself. During the blowing Heesen looks for the boundaries of ornamentation and ugliness. He creates glass 'as you would like to encounter in palaces and on faires, shiny and lavishly decorated'. Heesen's fascination for ornamentation of the 19th century goes back a long way. As of his early childhood he collected encyclopaedias from this period. In the 19th century industralisation and mass production went hand in hand. Industralised product were executed in historical styles and in this way the gothic revival, neoclassicism and baroque revival, among others, came about. Styles that were -even already in that time- associated with bad taste. It is exactly this reason why the second half of the 19th century is often referred to as 'the ugly time'. Instead of 'ugly'Heesen prefers to speak about 'folly', the folly of the 19th century. This exposition in Rijksmuseum Twenthe is about the infuence of the 'folly of the 19th century' on the work of Heesen. All the glass that is on display was inspired by this period and the engravings. Almost all the work was especially made for this project. Life-size prints of the engravings and encyclopaedias from Heesen's own collection, bring his world to life. 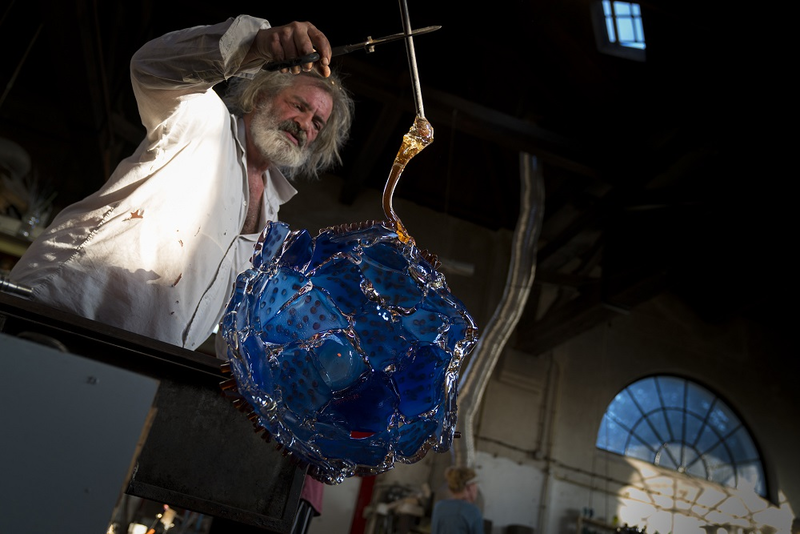 Bernard Heesen (1958) was educated as an archtict, but pursued glassblowing when his father Willem Heesen asked him to come and help in his glassworks De Oude Horn. Not hindered by knowledge of glassblowing and the tradition of the craftmanshio, he starts his quest for the possibilities of the material. In the mid-eighties Heesen definitely chooses glassblowing over architecture and in 1993 he takes over De oude Horn from his father. Heesen's art is collected by and displayed in many museums. Rijksmuseum Twenthe possesses over a hundred objects bearing his name, of which five impressive chandeliers that were made especially for the auditorium (The Gobelin Hall).